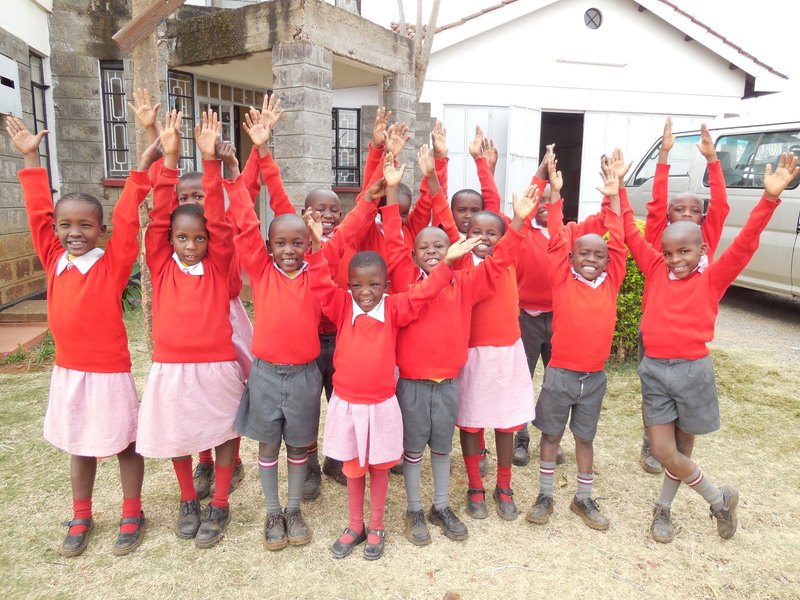 Some of our favorite kids in the world at home at SoH #2 in Kenya, including Sammy on the far right. Photo by Debbie Lee. We’ve never been the same after just a few short weeks in the summer of 2002. I led a team of six college and two high school students in serving at the Mother Teresa Home for Abandoned Children in Nairobi as part of the InterVarsity Kenya Global Project, directed by my good friends Brian and Debbie Lee. The year prior, my husband and I adopted our son from the same orphanage; and the college students all prayed him home and knew him personally. We wanted them to witness both the horror of poverty that scarred our hearts forever when we claimed our son, and also the mystery of the Mother Teresa sisters, serving in destitution with unrivaled joy. 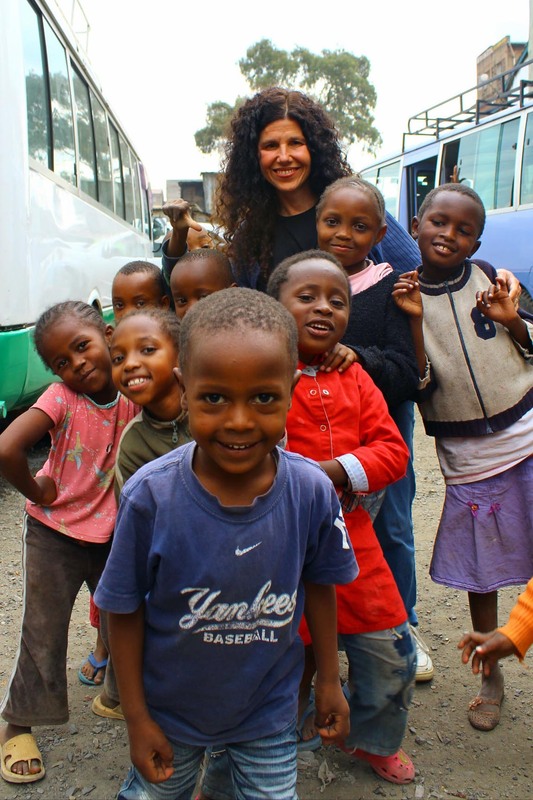 My friend and Pamba Toto co-founder, Debbie Lee, with children in Mathare Valley. Every day our team bounced along the sobering ride to the home, buried in the heart of a slum. Once inside the oasis compound, we eagerly headed to the wards to play with children and to help with assembly-line care. Our hearts broke when we discovered a child, healthy one day, terribly sick the next. We welcomed a newly discarded baby into the home. 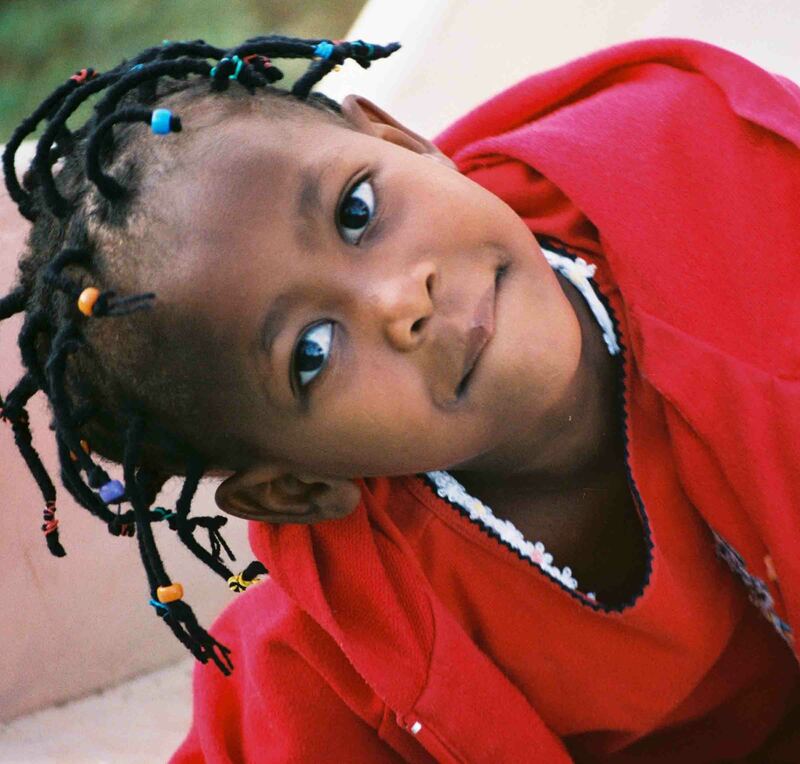 We rejoiced when we learned that one of the toddlers was chosen to be adopted by a Kenyan family. We fell in love. One of the high school students, Hannah, the Lee’s daughter, became attached to a very ill baby, Isabella. Brian and Debbie visited our team one day as we served. A practicing nurse, Debbie left the orphanage deeply disturbed. Sleep eluded her that night. She wrestled through long, dark hours until resolve pierced through with the early rays of morning light. She and Brian returned to the orphanage and begged the Sister Superior to allow them to take Isabella to a hospital for treatment, at their expense. The sister agreed, and asked them to also take another terribly ill child, Sammy. I requested they take one more, Emma, at my expense. Sammy 2002, 10 months old, with Jesse Lee and Sister Jessy after returning from hospital in June 2002. At the hospital, the Lees discovered that both Isabella and Sammy would surely have died within 24 hours without treatment, and Emma within a few days. No, Debbie and I could never be the same after that. 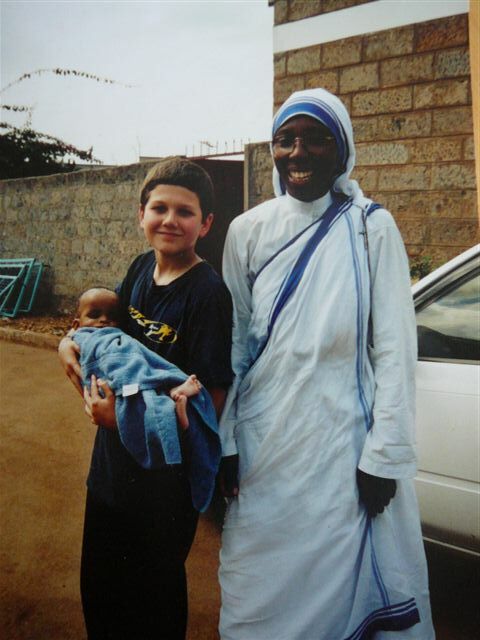 Our friendship deepened along with our passion for the orphaned children of Kenya as we spent more time at the Mother Teresa home and with dear Kenyan friends who served in desperate places, abounding with orphans. We were primed and ready to do anything we could to help as the dream of opening a small home for orphans called Sanctuary of Hope (SoH), with our beloved Kenyan friends the Karaus serving as house-parents, approached reality in 2005/06 under the umbrella of Hope’s Promise Orphan Ministries. The Lees and my husband and I spread the vision far and wide amongst our network of friends, church, and family; and funding accumulated. Still, I searched for ideas for how I could personally generate funding to open and sustain the home. As an artist, I most longed to invest my creative skills. Then for Christmas 2005, a relative gave me a hand-made necklace; and, unbeknownst to Debbie, a dream was birthed in my heart to make jewelry to raise money for SoH. Debbie called me soon after. “Do you think I’m crazy?” she asked me. Unable to work in her job as a nurse due to foot surgery, long hours of recuperating in a chair prompted her to brain-storm how she could maximize this unexpected slow-down. Debbie explained that she decided to sell jewelry to raise money for SoH. We are still in awe that simultaneously and independently of one another, we received a vision to make and sell jewelry to raise awareness and funds for SoH. Since then, we’re just hanging on to God’s coat tails as He expands the mission. Pamba Toto now encompasses various “lines” of jewelry and home products, including the pieces that I design and make, as well as crafts and jewelry made by women in Nairobi slums, and projects created by the Sanctuary of Hope children themselves (now numbering 24 and including Sammy!). We’ve learned a ton about marketing, consumer preferences, how to empower Kenyan crafts-people, etc. But through it all, our goal remains the same: to maximize profits and donate as much as we possibly can for the benefit of some of our favorite kids in the world! Our brand new logo! Many thanks to Ian Serff of Serff Creative Group, Inc.! We are excited to sell Pamba Toto products this coming July at a large, state-wide Texas PTA convention (many thanks to Danny Philhower of the TX PTA who has a vision to serve kids around the world!). So these days I’m taking breaks here and there from painting to play with beads. 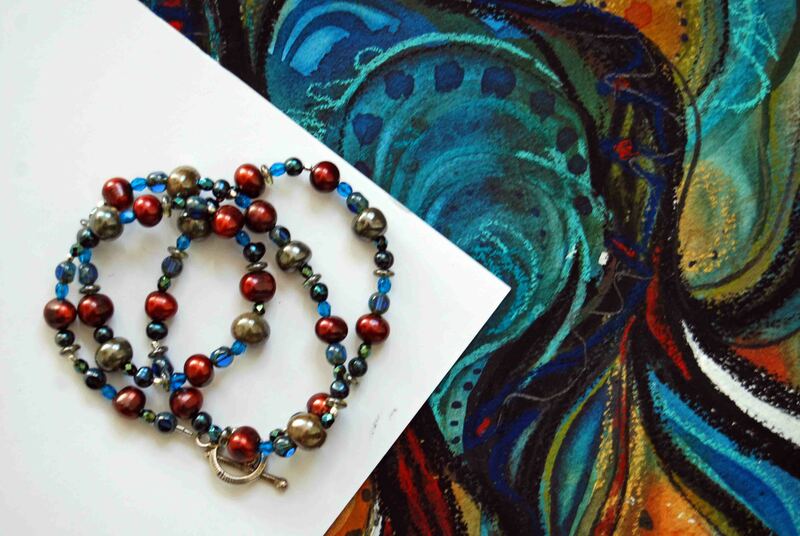 I love how the colors I am using in my paintings seem to seep into my jewelry without conscious intention. As I design and create, I weave a prayer into each piece and hope that somehow God will use these “loaves and fishes” to make a difference in orphans’ lives.